HTC Desire HD Specs Leaked: Another Huge Hit for HTC? Apple may want HTC to stop selling Android-based phones, but HTC refuses to slow down and launched two new devices Wednesday to great fanfare. The phones may be new to the rest of the world but U.S. users will recognize the devices, called the Desire HD and Desire Z, as variations of the HTC Evo and T-Mobile G2. But new phones weren't all HTC was offering. The company also said its Sense UI overlay will get some new features including new e-reading capabilities, revamped camera software and a new mapping feature called HTC Locations. The Taiwan-based phone maker is also launching a new Web-based utility that gives you remote access to your phone and data. If you ever lose your HTC device, you may be able to retrieve a lot of your data thanks to HTC's new Web-based utility, HTCSense.com. All you have to do is log on to the website from a mobile phone or PC, and you'll be able to access you contacts, call history and old text messages. If you're trying to find your phone at home, you can use the site to get your phone to ring loudly (even if the ringer is on silent) to help you find it. If your phone has been stolen, you can use HTCSense.com to remotely wipe your phone's data or lock it so no one else can use it. You can also have your phone calls and texts forwarded to another phone number through HTCSense.com. HTC did not mention pricing (or lack thereof) for the service or whether older devices would be able to use the site. HTCSense.com will launch in October. The specs for the HTC Desire HD are fairly close to the rumors that have been circulating about the device since July. The Desire HD has a unibody design built from a solid block of aluminum and features a 4.3-inch LCD display, Android OS 2.2, Dolby Mobile and SRS virtual sound, an 8 megapixel camera with dual flash and 720p high-definition video capture. The Desire HD will also be the first phone to feature the updated 1 GHz 8255 Snapdragon processor, according to HTC. Detailed specifications have not been published so it's not clear what kind of storage size or connectivity options the Desire HD will have. The Desire HD will be available in Europe and Asia in October; no U.S. dates or pricing have been announced. Despite lacking a U.S. launch date, the Desire HD's specs are very similar to Sprint's EVO 4G (minus the front-facing camera and kickstand). In fact, Engadget is calling the device the HTC "EVO for the rest of the world." So if the Desire HD sounds good to you, check out the Evo 4G as an alternative. The Desire Z is HTC's latest social-networking focused phone, and features a slide out QWERTY keyboard that features a 'pop' hinge for fast access. 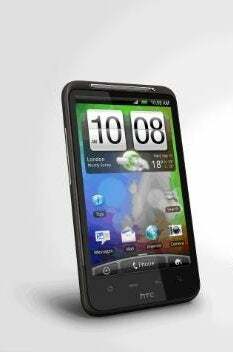 The Desire Z has a 3.7-inch screen, a 5 megapixel camera with autofocus and 720p video capture, Android OS 2.2, and 800MHz processor. If these specs sound familiar, that's because the Desire Z is the same device as the T-Mobile G2. Best Buy will start selling the T-Mobile G2 on October 6. The G2 will come with an 8GB microSD card and support cards up to 32GB in size. The new T-Mobile Android phone is also the first smartphone optimized for the carrier's HSPA+ network, and will be able to handle data speeds of up to 14.4 megabits per second.